The Braintree Historical Society seeks to perserve and share the history of Braintree, MA and its people. To this end, the Society operates the Gilbert L Bean Barn and Mary Bean Cunningham Resource Center to preserve local history. The resource center and library include Town records dating from 1640 onward. In 1975 the Braintree Historical Society (BHS) erected a colonial style barn as a complimentary addition to the General Sylvanus Thayer Birthplace. The post and beam construction of the barn is consistent with that of early American structures of its style. Although it is commonly referred to as simply “the Barn,” the structure’s official name is the Gilbert L. Bean Barn Museum. The Barn houses artifacts that would typically appear in colonial America. In 1995, the BHS completed an addition to the Barn, the Mary Bean Cunningham Historical Resource Center. The main level of this building houses the Society's library and resource center, and contains genealogical information on many prominent Braintree families. The lower level houses several thousand of the Society's collection items stored in a climate-controlled environment, where they are accessed periodically for rotating exhibits. THE GILBERT L. BEAN BARN, AND THE MARY S. BEAN CUNNINGHAM HISTORICAL RESOURCE CENTER. This rededication, today, provides us an opportunity to recount a history of two most important people, one of whom was a very special woman who made possible the building in which we stand, today, a history that was virtually lost. I’ll start in the 1950’s and bring that history up to date. As a teenager in the 1950’s I worked in the office of Barile Plumbing at Washington Street in Braintree Square. Late in the 50’s, there, all of a sudden, seemed to be a lot of excitement about the Sylvanus Thayer Birthplace being moved. Kids were filling jars with pennies, fund-raising was going on, and all the store windows had signs about it. Not knowing much about history, I did not pay much attention. 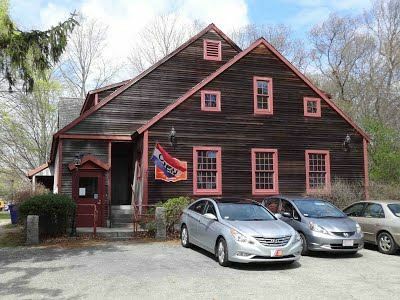 I did notice, though, Gilbert Bean was constantly in the Barile store to talk about the Thayer Birthplace, and Sophie Thayer Blunt, one of the founders of the Braintree Historical Society, who lived a few blocks down the street, was there doing the same thing. Joe Barile was a major plumbing and heating contractor and did work for many of the large housing developments at that time. Little did I understand the major project on which they were all working --- the moving of the Thayer Birthplace, in the Highlands, to its current location, on land then owned by the town. While the Society did not raise all of the money needed for the project, Gilbert loaned the rest, to be paid back at the rate of $500 per year. Gilbert Bean and his wife, Mary, had been the driving force behind the moving of the Thayer House, which was in place by 1960. Once it was in place, Constance Stoner Leggett had charge of furnishing the house with pre 1800 furnishings. Later upon her death, she left a treasure of antique additions to the house, as well as a substantial special endowment. The house story is another chapter in the Society’s history, for which I wrote a feature article in The Magazine ANTIQUES in May 1983. Once the dust had settled, Gilbert Bean had managed to buy land from the French family, behind the Asa French house, which included a substantial piece of land behind the Fire Station on Tenney Road, backing up to the Thayer House land. n March of 1972, he came to the town, and offered to give a piece of land behind the Fire Station, on Tenney Road, to the town, in exchange for the land on which the Thayer House stood. He would also give an additional piece of land behind the Thayer House, on Tenney Road, to the Historical Society. This backed up to the Thayer House property. Town Meeting enthusiastically voted to accept the offer. Gilbert had in mind to build an exact replica of a barn, appropriate to the age of the Thayer House, so people would understand what such a barn would look like. His dream was that the barn would be furnished with appropriate farm equipment and other items of an “outdoor” nature. 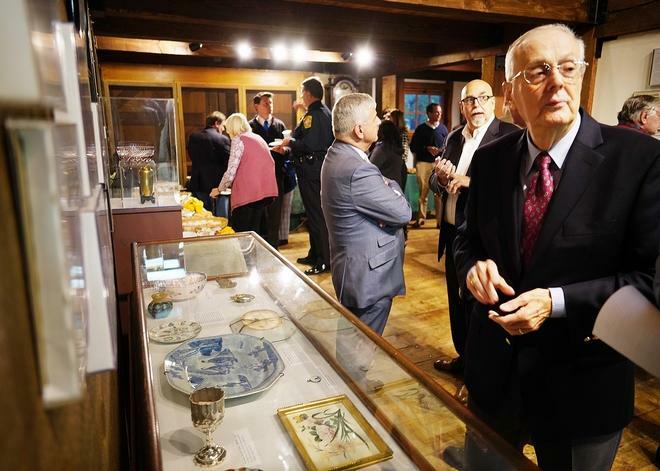 Additionally, at the time the Society was storing many of its artifacts in a room of the original Thayer Public Library, and Gib realized that it should be in our own space. He figured a vaulted basement would fit that need, as well as provide an official office for the Society. He began acquiring stone, granite and barn boards from those buildings and barns being demolished, to be used in the new building. Though a plan had been approved for the barn museum by the board in June 1972, it was not to be. On a flight to a Wedgwood International Seminar in England, on 8 May 1972, Gilbert died on the plane. The plane had to put down in the Azores, and his wife, Mary, bought a locally made, hand carved casket to ship the body back to Braintree. By 1974, when I was the Society’s President, Mary Bean wanted to find an appropriate way to memorialize her husband, and came me to see if I thought we could raise the money to build Gib’s dream barn museum. I said yes! The Society’s board was in favor of the project, and Malcolm Walker took on the job of finding a builder who could build it exactly as an 18th century barn should be. I appointed Bob Daylor as Fund-Raising Chairman. Mary had contributed substantial funds of her own, and convinced many others to support the project. On one occasion I had agreed to hold a major fundraising dinner at my home, with Mary Bean and the women of the Emmanuel Episcopal Church providing Mary’s famous boeuf-bourginnone for the nearly one hundred people invited. hat day her mother died, but Mary was a trooper, and said nothing would interfere with the project, so she was at my home, overseeing the dinner. We raised the money-- before a shovel was put in the ground --and I presided over the dedication in 1976, with a major formal program and symphony orchestra playing at the town hall, prior to the actual dedication. Had it not been for Mary Bean, the project would never have taken place. The Gilbert L. Bean Barn was built. After my term as President, I became a long-term Treasurer of the Society. Mary Bean and I had worked on many projects together, and she and I, along with Connie Leggett, were active members of the Wedgwood Society of Boston. In many ways, Mary Bean’s interests overlapped with mine, and we became very close friends, until the day she died in 1990, when we spent her last hours together. A few years after Gib’s death, Mary Bean had married Donald Cunningham. Both Gib, and Don’s wife had died. They had all been good friends and Mary and Don decided to spend the rest of their years traveling the world and doing good in Braintree. By 1988 The Society was experiencing major growing pains, and the need of additional space. In 1990, Mary Bean Cunningham, came to me and had a dream to build a state-of-the art, fully climate-controlled Library and Archives with storage facility underneath, to house the extensive costume collection. She told me she would give me $50,000 if I could raise matching funds, to get the project off the ground. By that point she had developed cancer and was living in the Rice Eventide Home in Quincy, where she had served on the Board of Directors. She gave me documents to assure her commitment would be fulfilled. The Board of Directors enthusiastically supported the project knowing there was a great need for a better library and archives. Serving as Treasurer, I knew where a potential for funding would be, and started contacting some of our major donors. By December 1990, we had raised $156,000 with a few other commitments. Much of the funding came from the Penniman family, for whom the Genealogical section of the Library was to be named, with major additional contributions from the Rockwell/Thayer family, plus many, many more.. By the time a shovel was put in the ground, we had all the funds necessary, approximately $500,000, to pay for the building. The design replaced the barn doors facing on Tenney Road, with a glass wall and to make the new library totally climate controlled, while being able to see the barn through, basically, a big picture window. The barn doors were moved to the back of the barn, facing the Thayer House. During the construction of the building, Malcolm Walker, acting as clerk of the works, developed cancer and could no longer undertake that job. My wife, Mary Frazier, who was serving as President from 1993-1995, undertook that position. The project was completed shortly after her term of office expired. By then, the Board of Directors, realizing that Mary Sturtevant Bean Cunningham had been the moving force and financial catalyst for both the barn and the addition, decided to name the addition The Mary Bean Cunningham Historical Resource Center, and it was so dedicated on September 23, 1995. As time went on, and with the Society having substantial funding, its Board hired a paid Executive Director who decided to take the Society in very different directions. A major decision was made to move the Society’s Library, to a vacated former Thayer Public Library building in East Braintree. The move proved to be a logistical and financial disaster. By that point the Mary Bean Cunningham Historical Resource Center had a total make-over as a museum, eliminating all of its specifically designed library features and any reference to Mary Bean Cunningham. Then, realizing, a few years later, the move had been a disaster, the Library had to be moved back, but was relegated to the basement, and what was not stored there, went to the attic, along with all costumes and textiles. As a result the costumes and much of the archives were stored in the Barn attic, which was NOW not climate controlled, ultimately leading to considerable damage to the collections due to mold mildew, insect and mice infestation. About 2015, after some financially questionable moves and many personnel changes had taken place, the Board came to the realization that the original plans were well thought-out and should be re-implemented. After much work by Ruth Powell, Mary Frazier, Bob Harris and Derrick Manning, with the help of John Dennehy, the Library has been substantially returned to its original use, and is now under the professional guidance of Claudia Shutter and Claudette Newhall. With two new volunteer, professional librarians, the library, back in its original location, will be more useable than ever. The archives, costumes and textiles, under the direction of Mary Frazier, have now been returned to the climate controlled basement. And that is how we arrived at the point where we are today. The Gilbert L. Bean Barn, and the re-dedicated Mary Bean Cunningham Historical Resource Center. Without Mary Bean Cunningham, the Barn or the Resource Center would never have been a dream, or become a reality. To Mary Bean Cunningham we must once again say Thank You. I’m sure you and Gib were spinning in your graves for a while, but you can now, once again, rest in peace.